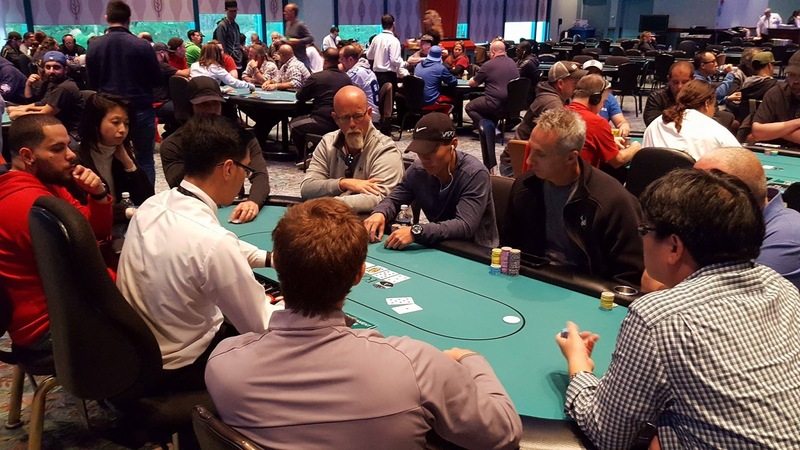 There are 57 players remaining and they are now hand for hand. Play will continue until they reach 56 players, and then those 56 will bag and tag for the night, and return tomorrow to play Day 2 at 12:00 noon. 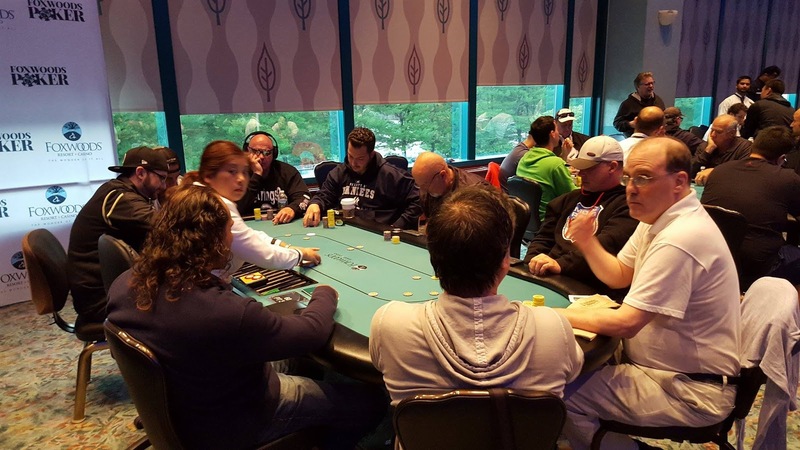 After play concludes, we will bring you a list of advancing players and chip stacks as soon as they are available. 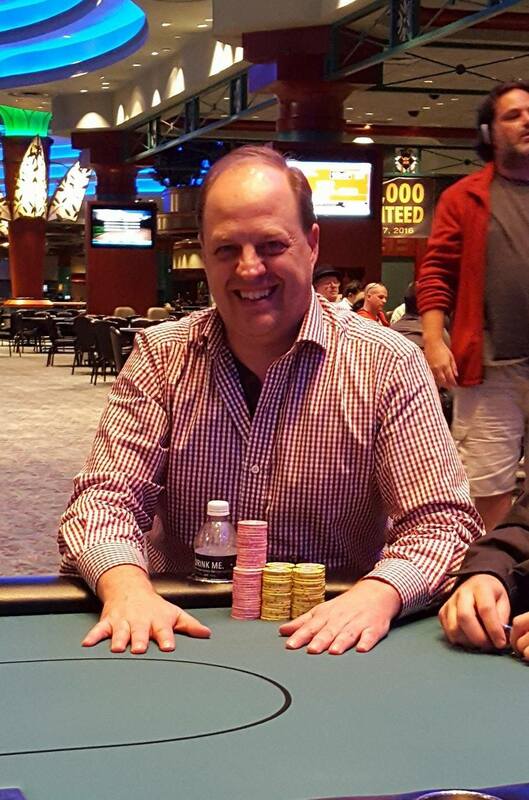 Joe Heinzmaan leads the post break notable chip counts with 375,000. According to Heinzmann, he knocked out Carlo Sciannameo with aces vs. ace king and also won a big pot off of Dave Stefanski. 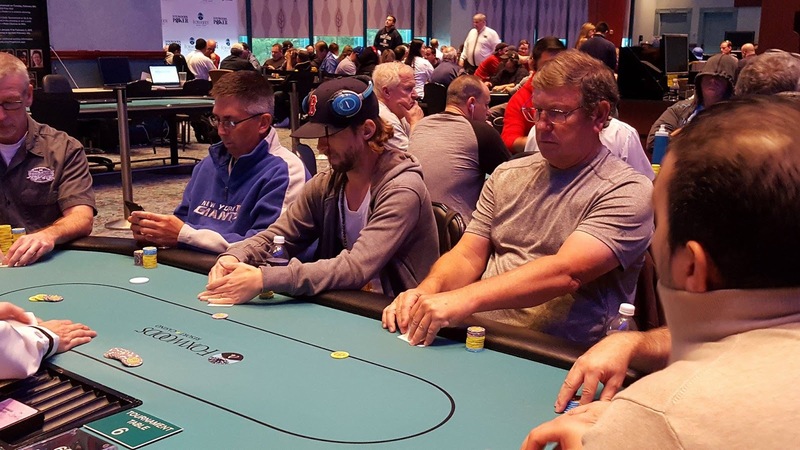 Heinzmann doubled early in the day when he flopped a set of aces against two opponents, one holding a set of sixes and the other flopping two pair. He took the early lead and has been building steadily ever since. The remaining players are now on a 60 minute dinner break. 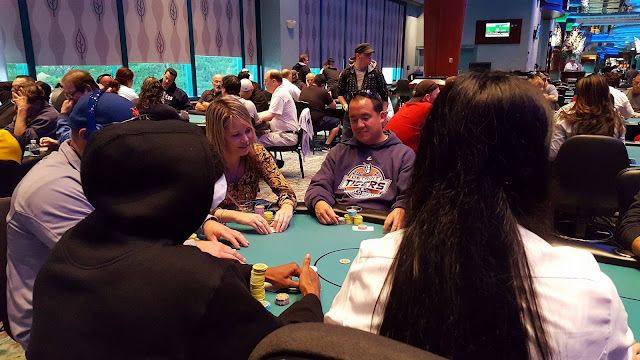 They will return to play Level 14 (1,000/2,000 blinds with a 300 ante). The clock reads 119 players remaining. As a reminder, this flight will play down to 56 players before bagging and tagging for the night. And all three flights will join together tomorrow (Tuesday) at noon to play Day 2, with all players making Day 2 in the money. 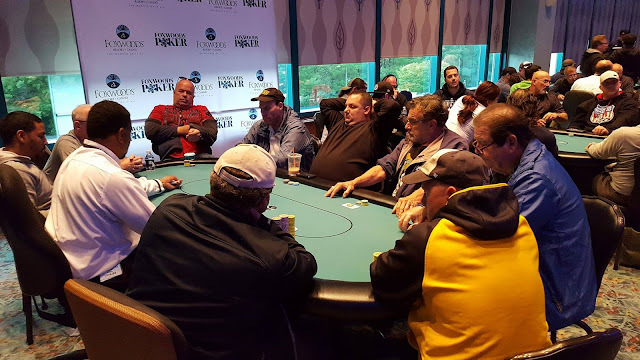 Here are just a few photos from around the room of Flight C.
There were a total of 467 entries in today's final flight of the $600 No-Limit Hold'em Re-Entry Event #1. They will play down to the final 56 players before bagging and tagging later tonight. Those 56 players will join the 32 advancing players from Flight A and the 28 from Flight B, and will play Day 2 on Tuesday at 12:00pm. All players to make Day 2 will return in the money. The prizepool for this event will be available late tonight/early tomorrow and we will post it as soon as it's calculated. Joe Heinzmann raises to 1,800 from under the gun. A player in middle position calls, as does the big blind. The flop comes A♣10♥6♦. 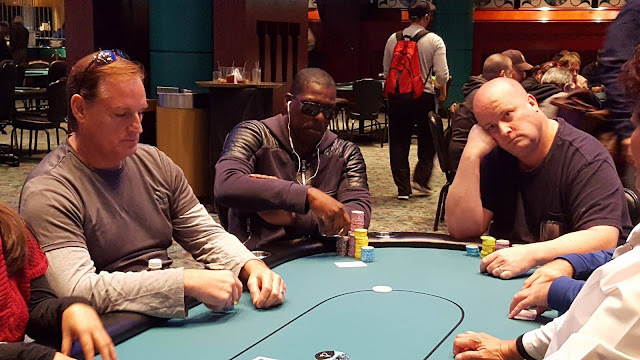 The big blind and Heinzmann both check, and the player in middle position bets 3,000. Both players call. The turn is the J♠. The big blind and Heinzmann both check again, and the player in middle position bets 4,100. The big blind shoves his remaining 11,000 into the middle, and Heizmann calls. 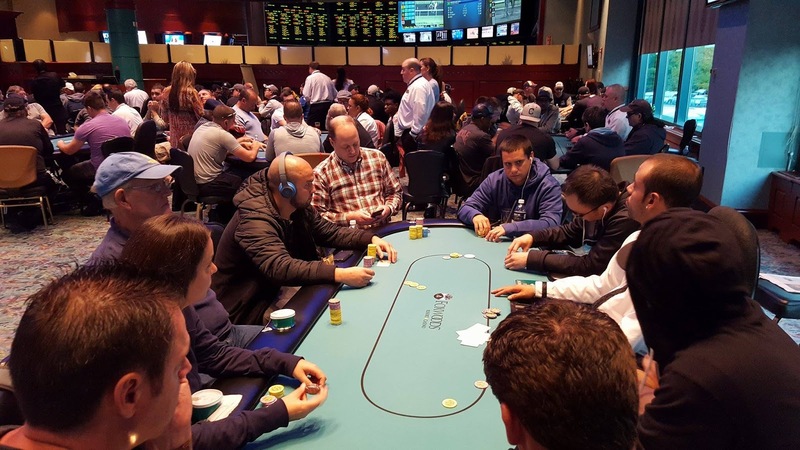 The middle position player pauses before announcing that he is all in, having both players covered, and Heinzmann calls for his remaining 49,500. 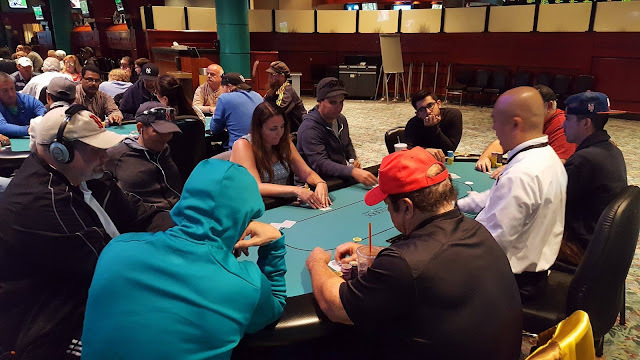 The 9♦ river does not change the hand, and the big blind is eliminated from play, while Heinzmann doubles through the middle position player. According to Eric Siegel and Joe Reddick they played a very interesting hand right before the last break. Siegel started the hand with around 45,000 and Reddick started with around starting stack (20,000). Reddick had raised under the gun and Siegel called. The flop came 5♣3♣2♣. Reddick bet 3,000, Siegel raised to 8,500, and Reddick shoved all in. Siegel called and the players tabled their hands. 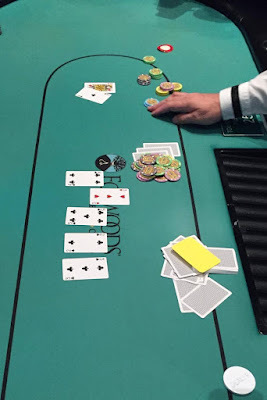 The turn was the 3♠ giving Siegel quads threes and seemingly the win, but the 4♣ river changed everything giving Reddick a straight flush, and he was awarded a double through Siegel. Tim Fiorvanti is no stranger to poker, and especially to mixed games. In March of this year, Fiorvanti took second in this same event ($300 PLO Hi Lo 8+) in the Foxwoods Poker Classic Series. This evening, he closed it out, adding another $3,360 to his already impressive live earnings total. Fiorvanti started working in the poker industry in 2009 and worked for Bluff Magazine for six years as Managing Editor. He now works for ESPN.com. 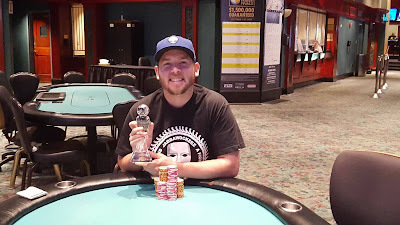 Congratulations to Tim for winning his first Foxwoods trophy in Event #3! Players are just coming back from the first break of the day in Flight C. The clock reads 326 entries, and anyone wishing to enter/re-enter has until the start of Level 9 to do so. As a reminder, this event features a stack buy back (best stack forward), and a $500,000 guarantee.